Linda Elder, President and Senior Fellow at the Foundation for Critical Thinking, was married for twenty years to its founder, Richard Paul. Both described their marriage as "perfect." Richard Paul died in August, 2015 of Parkinson's disease. During the course of their time together, he wrote hundreds of poems. These can be roughly divided into three categories: 1) love poems to Linda, 2) poems on the problem of irrationality in human thought and life, and 3) the problem of death. 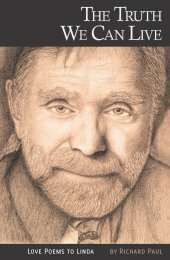 This book includes poems of the first category - only some of the many that Richard created. Richard Paul always felt that at some point he would want his poems published, though each was written privately to Linda. The reader will appreciate the importance of now making these poems public - for those finer thinkers who can appreciate sublime poetry focused on significant human concerns. To deal with the sadness she experienced while losing her husband, Linda Elderr turned to art in the fall of 2014. Using graphite on acid-free paper, she drew approximately ten portraits of Richard, attempting to reach something like the sublime space she had known with him. The best of those portraits are included in the book, the cover displaying but one of them. To the intelligent reader, the eloquence with which Richard captured profound love will be apparent in this book. The reader may also perceive through his poetry something of Richard's real goodness, and of the remarkable power of his mind.